With my old car back home once more, I was left with a fairly incomplete chassis. Two areas that were lacking the most were the suspension and brakes. I needed a number of items to get the car road worthy including a complete brake setup for the front and rear, adjustable suspension arms, and a set of coilovers. 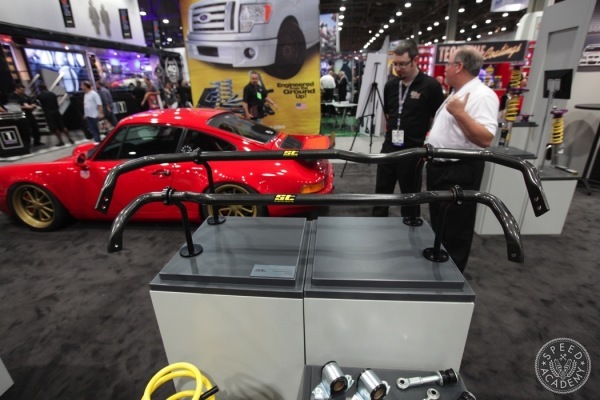 As any S-chassis enthusiast will tell you, it’s imperative to replace the aging and worn suspension components with something more rigid and adjustable. 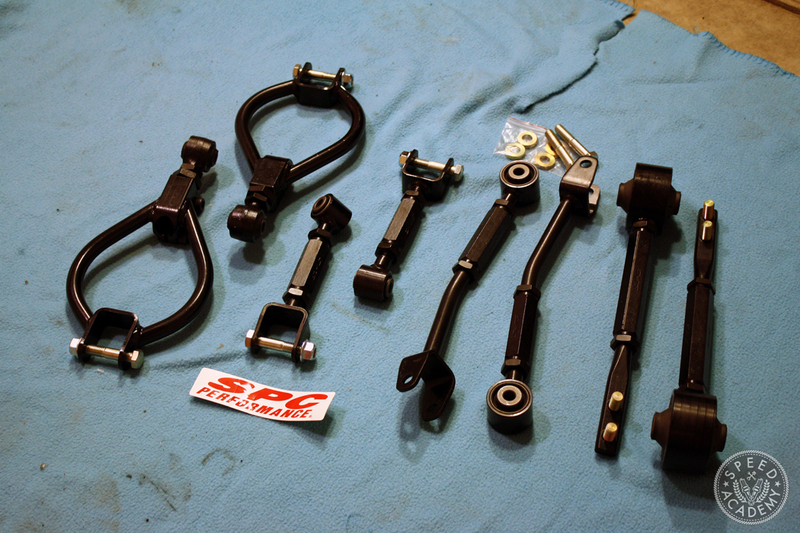 The fine folks at SPC Performance supplied me with a slew of their adjustable arms for my build including tension rods up front and upper control arms, toe arms, and traction rods for the rear of the car. Having run a set of these arms years ago on the car, I was pretty geeked to bolt these in place. 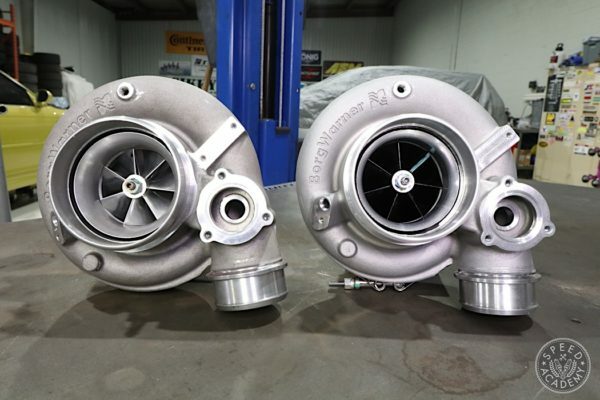 Many people choose to run more aggressive arms with wider adjustability and metal spherical bearings that work really well for a dedicated track car, which definitely makes a lot of sense. 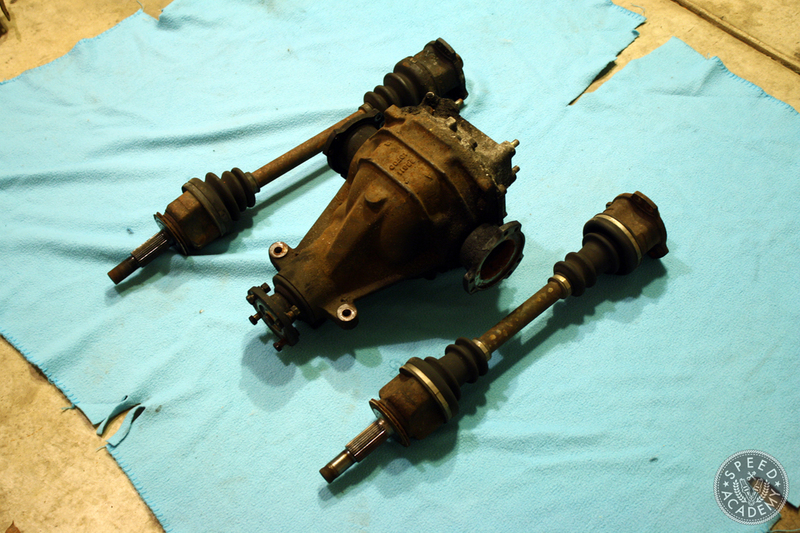 Considering the fact that my car will primarily be a street car, the SPC components are perfect. 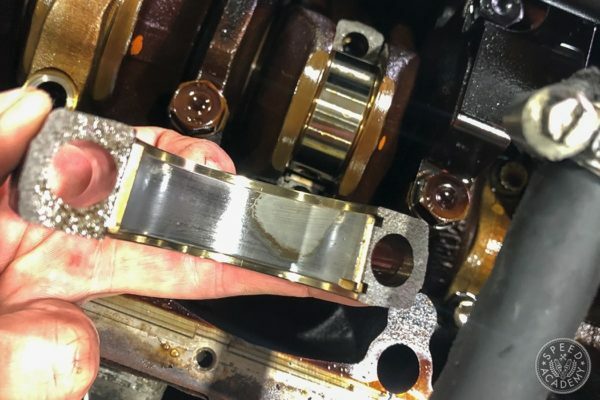 These arms utilize a stiffer rubber bushing than the factory arms that increases performance without sacrificing ride quality like a metal bearing often would. 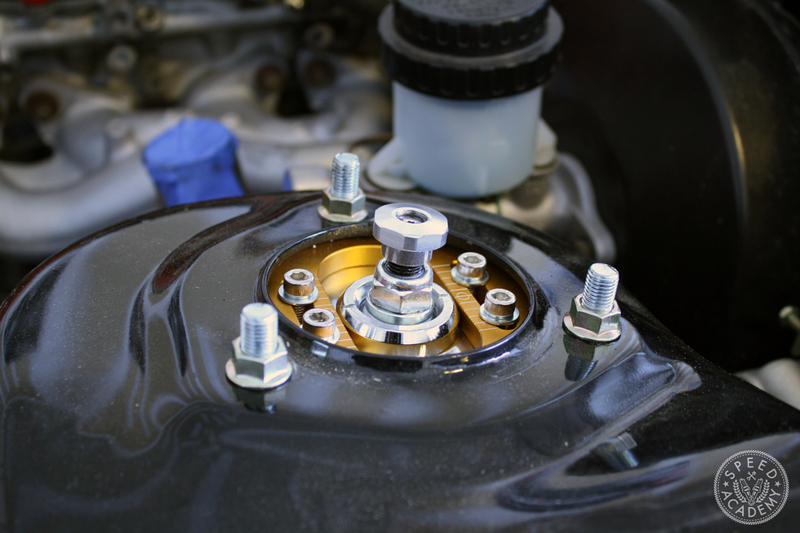 The additional adjustability that’s offered is perfect to get your alignment specs dialed in when the car has been lowered substantially. 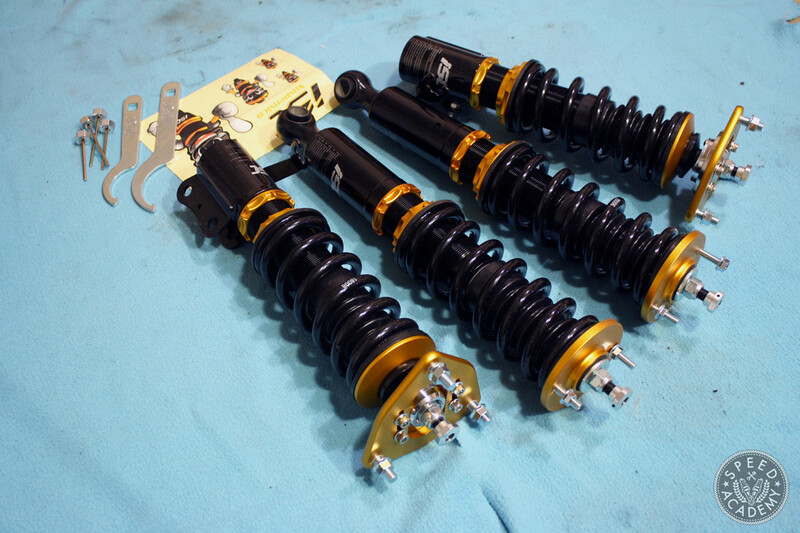 All of these adjustable arms wouldn’t be of much use to me without a decent set of coilovers bolted to the car. 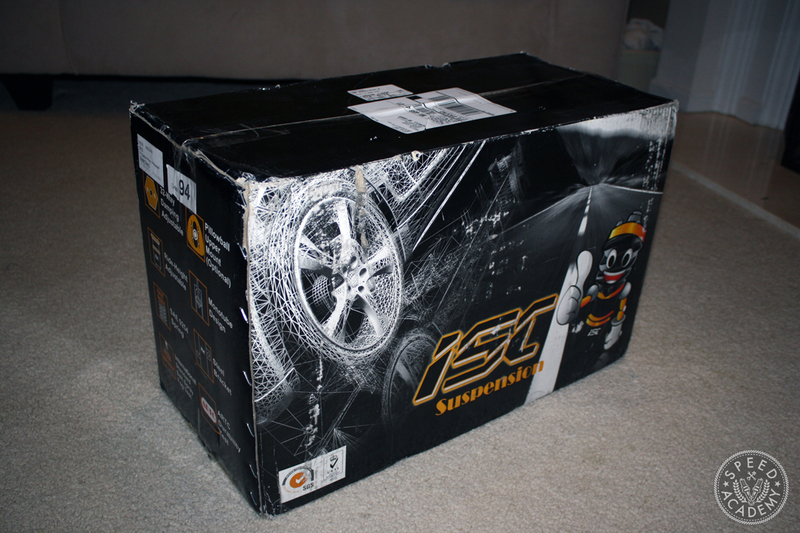 Thanks to Turn 14 Distribution, I was greeted by a large box from ISC suspension on my porch one snowy January evening. 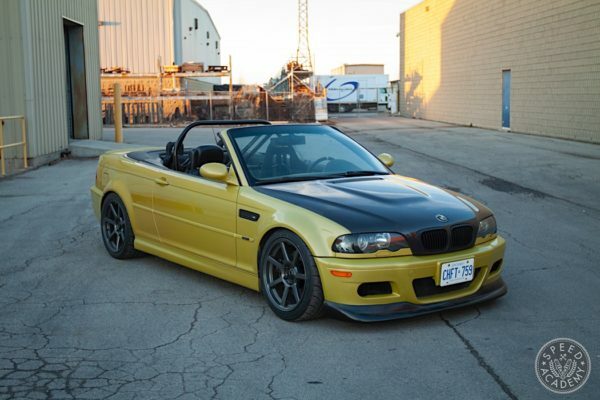 There are tons of coilovers on the market for the S chassis ranging from unbelievably cheap to incredibly expensive. For most of us, we want something in the middle and that’s exactly what I was looking for. 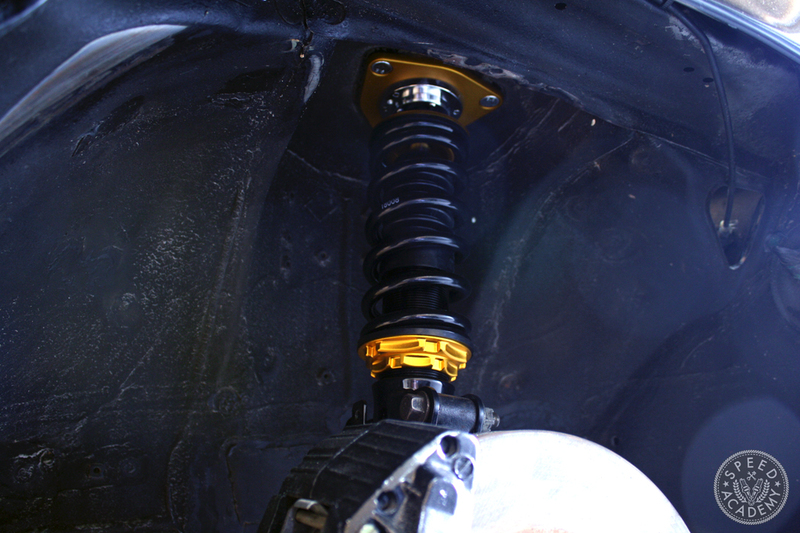 A coilover that would give me a good range of height adjustment and enough damper adjustability that I can set them up to my liking. I’ve never used ISC coilovers before so I’ll be sure to report back on ride quality and performance in the near future but upon first inspection all of the components appear to be top notch. I particularly like the rubber boots that protect the piston rods on the damper. 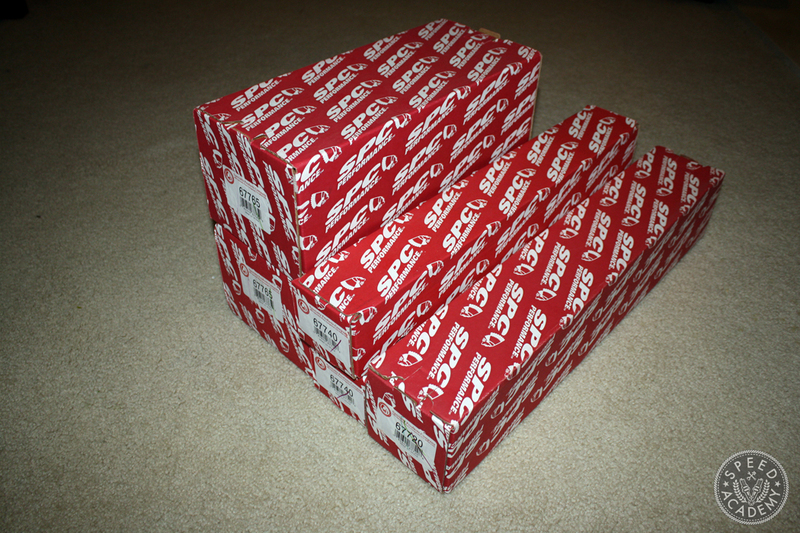 It’ll keep the grimy Michigan road debris from doing any damage to the coilovers. The kit also includes adjustment wrenches, damper adjustment tools, and even new nuts for the top mounts on all four corners. ISC’s S13 coilovers deliver all of the goodies you’d expect to find from any big-name manufacturer: adjustable front camber plates, 32 step damper adjustment, T6061 aluminum brackets, and a five year warranty against material and workmanship defects. Not to mention the fact that they appear to offer ample ride height adjustment to help me get the look I am hoping to achieve for the car once its completed. 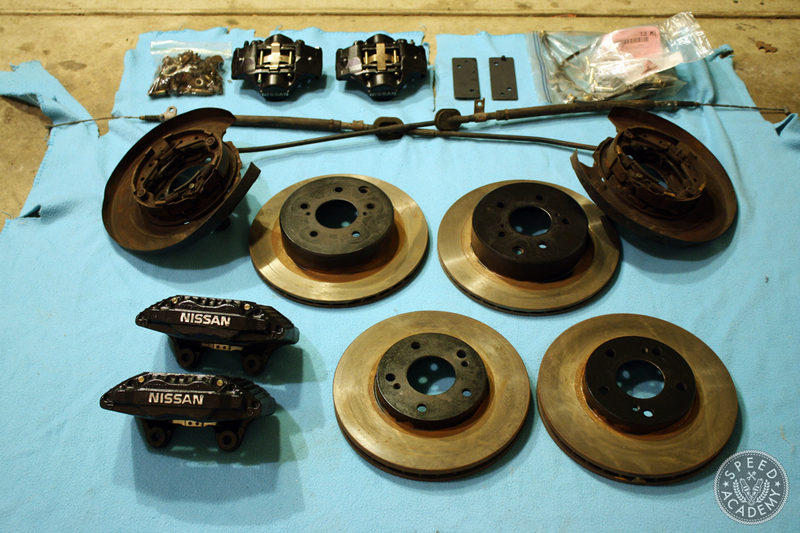 After all of the new suspension items were in place, I needed to track down a set of brakes for the car. 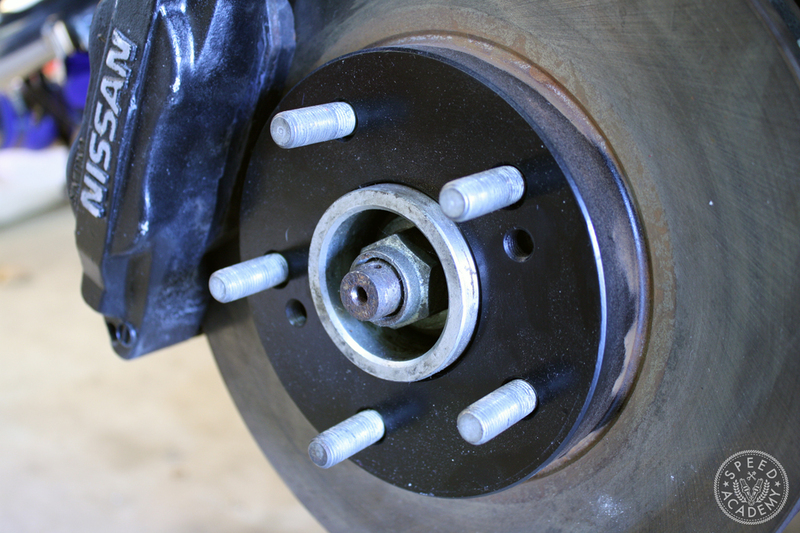 While browsing the forums, I came across a great deal on a full set of Z32 300ZX brakes that happen to be a bolt-on solution for a five lug converted S13. The setup included remanufactured front and rear brake calipers, pads, rotors, and stainless steel brake lines for the conversion. 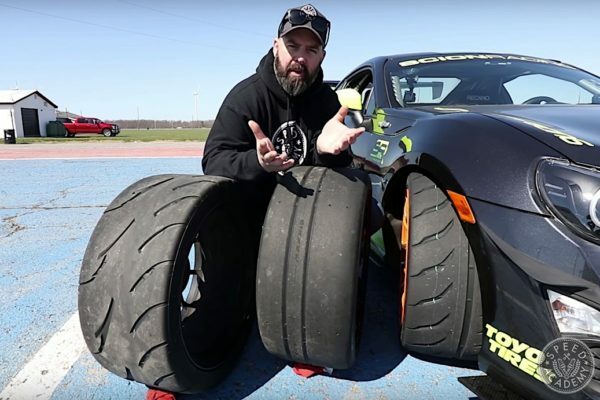 While this setup is more than capable of getting me on the road, I’ll probably look into upgrading the pads and rotors to something a bit more performance-oriented down the line to really make this upgrade worth the extra effort. 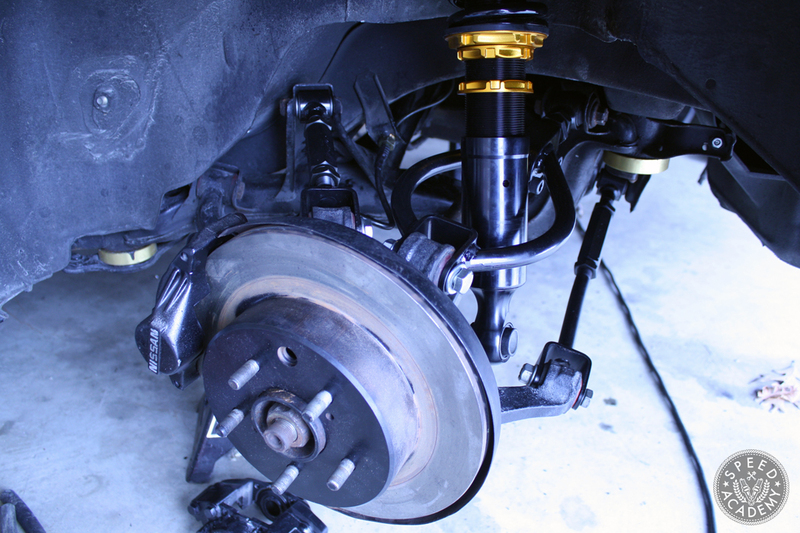 My previous brake setup on the car utilized an upgraded Z32 brake master cylinder, and luckily it was still in place when I purchased the chassis back. The final piece to the braking puzzle was a set of 300ZX emergency brake drums, cables, and some conversion brackets I scooped up on eBay that allow the e-brake cables from the Z car to be bolted properly to the 240SX chassis due to their differences in wheelbase. While I was under the car tackling the suspension and brakes, I took care of sourcing and installing a differential for the car. I previously ran a few different diff setups in the car ranging from a viscous LSD, S15 helical, and even an aftermarket 2 way. I elected to sell my previous pumpkin when the car was parted out and needed something to get me rolling, so I picked up an Infiniti J30 VLSD and axles for a great deal locally. While it won’t lock up aggressively, it should offer a decent balance of performance and comfort for my street S13 build. Perhaps this is another area that I’ll upgrade later down the road someday. Despite most of the key components being missing, a decent amount of the items I installed on the car previously were left in place. Parts Shop Max subframe riser bushings, Energy Suspension polyurethane control arm and upright bushings, and Ichiba five lug conversion hubs were all added during my previous ownership to further refresh the car’s 22 year old suspension. These upgrades combined with the newly added items from Turn 14 should make for a worry free chassis that tracks straight as an arrow. I’ll be sure to check-in during a later installment after the car is on the road with some feedback on how these items impact the car’s handling and drivability- stay tuned!